It’s easy to get caught up in the details when developing infrastructure. You know it will be useful – because the grant application said so! But there’s so much engineering to do. And no matter how thoughtful and deliberate a process you follow to anticipate the needs of your future users, once they have a complicated thing in their hands who knows how they will actually use it. Enter the Phenoscape Knowledgebase. After a heroic data collection push this winter, our next release of the Knowledgebase will contain millions of evolutionary phenotypes from throughout the vertebrates, linked to genetic phenotypes from human, mouse, Xenopus, and zebrafish, and a particularly rich set of annotations for skeletal features of fins and limbs. The Knowledgebase is far from comprehensive, and annotations do not capture the full richness of the original characters in the evolutionary literature, but we think it’s a pretty useful resource. So, it’s time to see what capabilities our users are excited by and what limitations frustrate them. To that end, we brought a small group of experts who look at phenotypes in a variety of different ways (e.g. genetics, systematics, evo-devo, clinical biomedicine, paleontology, even zooarchaeology) to the California Academy of Sciences in February, and we asked them what questions they’d most like to address using the KB as it exists today. 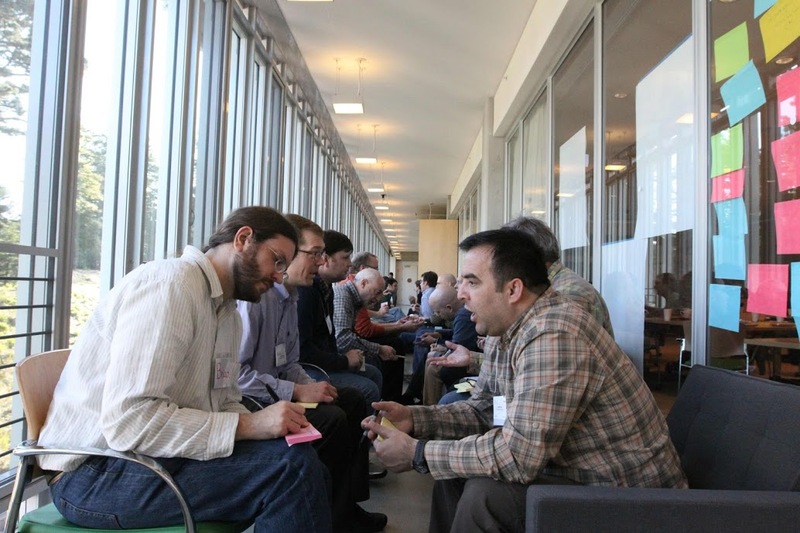 To help us in tapping into the assembled brainpower, we enlisted KnowInnovation, facilitation pioneers that specialize in helping researchers self-organize into teams to tackle creative research challenges. This they did with amazing resourcefulness, milking ideas out of us that we wouldn’t have imagined we even had. The workshop was no ordinary parade of PowerPoints. 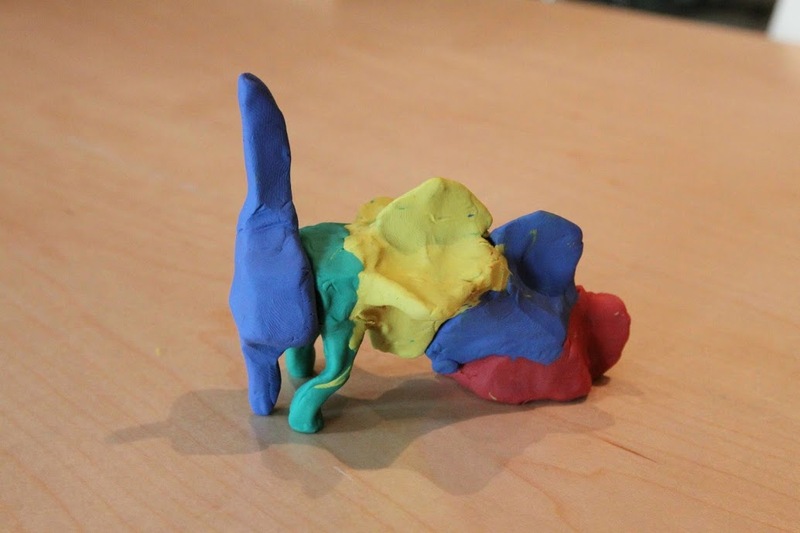 We did speed-dating to toss research ideas off of each other, generated a staggering number of post-it notes, sculpted creatures and skeletal parts out of clay and engaged in a host of other seemingly contrived but strangely liberating activities. 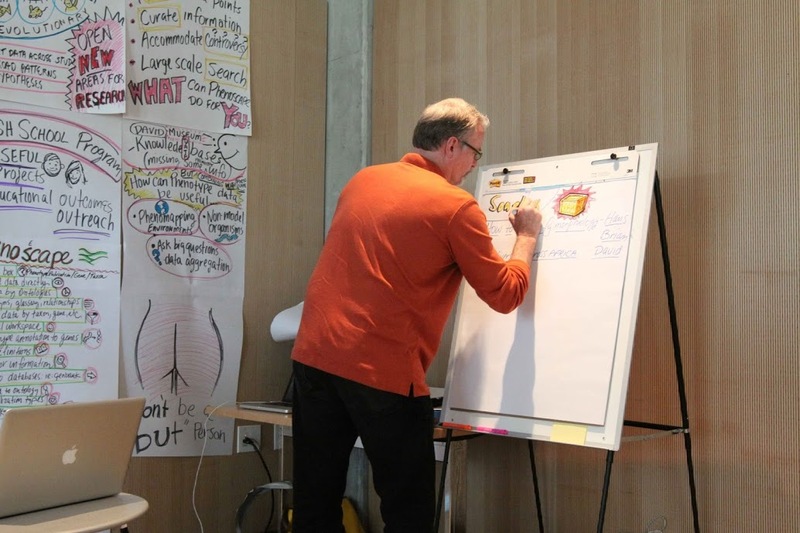 We watched in amazement as Karl Gude took visual minutes. And we came up with some great collaborative ideas for research that take leverage the Knowledgebase to ask questions that would have been difficult to impossible to answer without it, including questions about genetic convergence and parallelism, global comparisons of intra and interspecific phenotypic variation, and the evolution of phenotypes affected by duplicated genes. These projects will now serve as driving applications for Phenoscape so that we know better what our users really need the Knowledgebase to do for them. We look forward to reporting on the outcome of those in due course. A big thank you to David Blackburn and the Cal Academy for providing such an inspiring venue, being exquisite hosts, and for conveniently having an open museum night during our workshop. Thanks also to a great group of participants and facilitators, and to to NSF for a supplemental award that helped to make the workshop a success. At the end of October 2012, the working groups of the Phenotype Research Coordination Network (RCN) all met at the Asilomar Conference Center, in Pacific Grove, CA. One of the groups, the Vertebrate working group, made it their goal to discuss methods of representing phylogenetic and serial homology in anatomy ontologies, an issue that is central to Phenoscape as well. Though common ancestry is implicit in the semantics of many classes and subclass relationships (see for example the ‘homology_notes’ for digit in Uberon), most multispecies anatomy ontologies, including Uberon, VSAO, and TAO, do not assert homology relationships between anatomical entities. Nonetheless, homology is central to comparative biology, and therefore to enriching computations across data types, species, and evolutionary change. What new research opportunities are opened up by the power to compute over phenotype information from thousands of species of vertebrates, particularly when that information is combined with phenotype and expression information for thousands of genes in multiple model organisms? The Phenoscape project invites you to be among the pioneers in opening up this research. The first release of the Phenoscape Knowledgebase includes over 500K species phenotypes linked to 4,000+ genes from zebrafish, and is currently being extended to capture phenotype data from other vertebrates and linked to phenotype and expression data for other model organisms (including mouse and Xenopus). 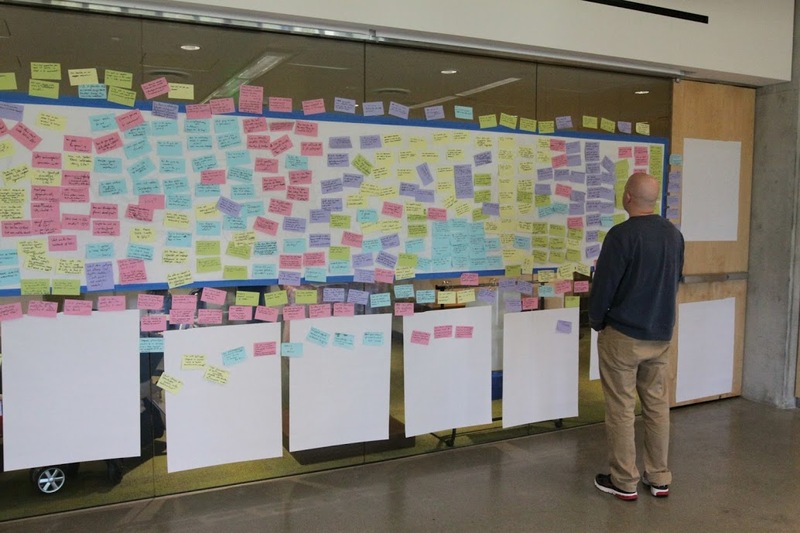 We are looking for participants for a small, 3-day workshop, February 8-10 (to be held at the California Academy of Sciences, San Francisco) who are interested in engaging in creative problem-solving directed at this outstanding problem and initiating collaborations. 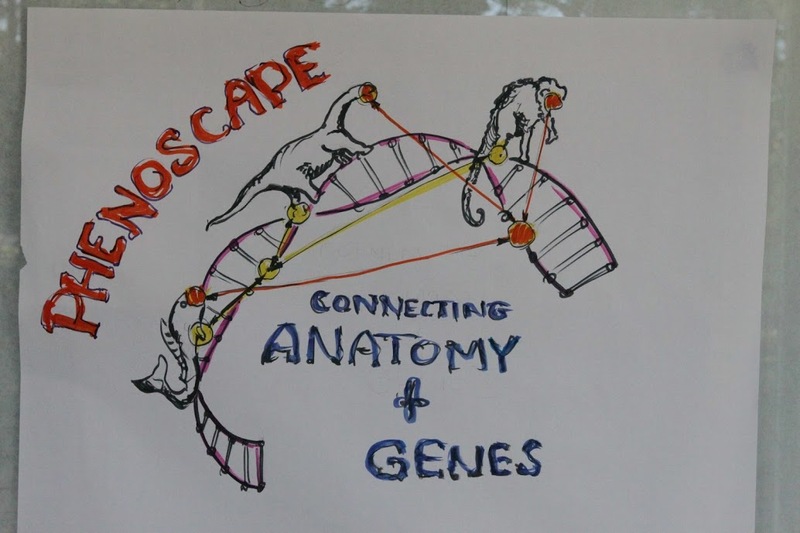 The outcome is expected to be several collaborative projects whose goals would drive the development of the Phenoscape tool set/interface and would present new and creative ways to deepen understanding of phenotypic evolution. Phenoscape aims to support the initial steps in these activities. We are particularly interested in a broad approach to this problem and welcome interest from scientists with backgrounds in computational and systems biology, mathematics, development, genomics, and evolution. If you are interested, please contact Paula Mabee or Todd Vision. A summer course on anatomy ontologies is being offered for the first time through the NESCent Academy and the Phenotype Ontology Research Coordination Network. The intended audience is postgraduate researchers in evolutionary biology and informatics – including students, postdocs and faculty – who are relative newcomers to ontologies. It will be held from 30-Jul to 3-Aug 2012 in Durham, NC. Spread the word, and if you are interested be sure to apply before the deadline of 6-Apr. [Full disclosure: a number of long-time friends of Phenoscape are among the instructors]. Evolutionary research has been revolutionized by the explosion of genetic information available, and anatomy ontologies must play a central crucial in relating this knowledge to observable diversity. Anatomy ontologies and vocabularies are widely used to index data and are critical for relating gene expression and phenotype data across taxa. Within a single species, anatomy ontologies provide scaffolding that interconnects many kinds of observations; across species, they provide evolutionary, developmental, and mechanistic insights. In order for anatomy ontologies to successfully serve all of these purposes, they must be constructed consistently so that they can be utilized and understood by both researcher and software alike. This course aims to teach proper ontology design principles and practices such that anatomical interoperability across evolutionarily disparate taxa is achieved. It further seeks to promote community growth and adoption of ontology-based methods and tools. The subsequent benefit is in the form of shared access to the unique data store of each community (e.g. genetic, genomic, developmental, and evolutionary data). The course covers a basic introduction to ontology design principles and usage, specific ontology considerations for anatomy, application of anatomy ontologies in the context of evolutionary phenotype comparison, and use of anatomy ontologies for image annotation in different taxa. There will be strong emphasis on hands-on exercises that will develop ontology skills and provide exposure to different software applications that are useful in variety of areas of evolutionary biology.